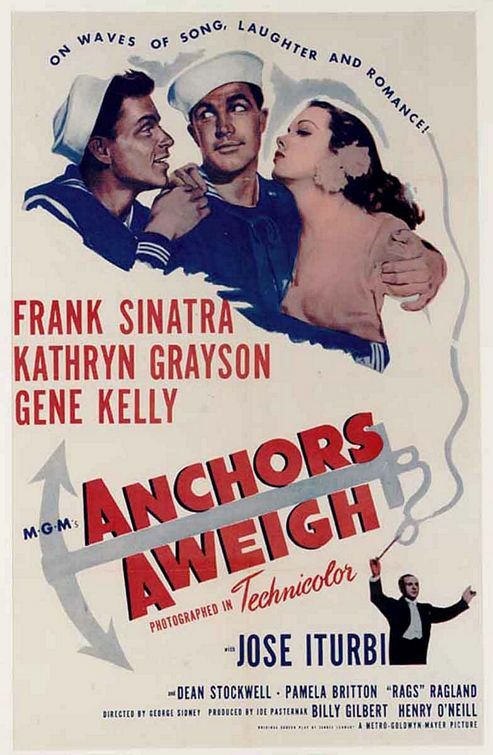 A pair of on-leave sailors — bashful Clarence (Frank Sinatra) and ladies’ man Joe (Gene Kelly) — both fall for the beautiful singing aunt (Kathryn Grayson) of a young would-be sailor (Dean Stockwell), and promise her an audition with famed conductor Jose Iturbi, despite not really knowing him. 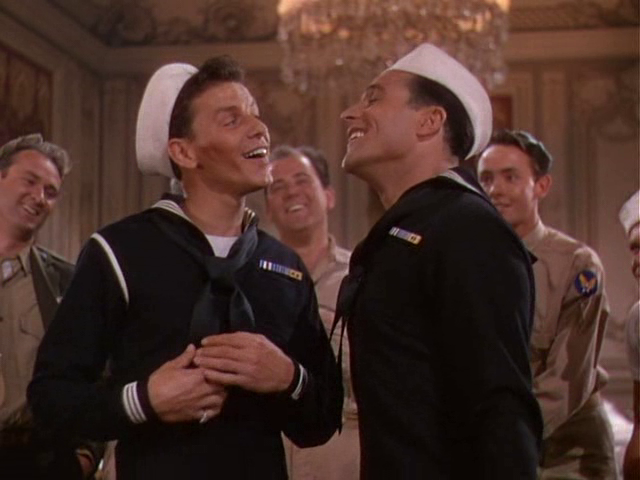 Peary notes that while “Kelly became a big star as the wolf of the navy” in this George Sidney-directed MGM wartime musical, “Sinatra is better as his best friend, a bashful manchild from Brooklyn” who “falls for sweet… Grayson” and “tries to impress her by promising her a singing audition with Jose Iturbi”. He argues that the “flimsy plotline is not helped by timid romantic leads Kelly and Grayson” — but this complaint doesn’t quite hold water, since Kelly and Grayson are justifiably reticent to express their feelings for one another given Sinatra’s initial interest in Grayson (and Kelly’s noble attempt to step out of his way). Meanwhile, Peary asks, “Who cares about a story centered on orchestra conductor Iturbi?”, but this complaint also isn’t quite accurate, given that Iturbi only shows up to contribute some musical numbers, and his presence primarily functions as a plot device. With that said, I do have some complaints of my own: while Grayson’s romantic timidity makes sense to me, she’s simply not a very nuanced or interesting character (and her singing style is way too dated to appeal to most viewers). Even worse, the film goes on for far too long (2 hours and 20 minutes! ), and the storyline really isn’t all that compelling. 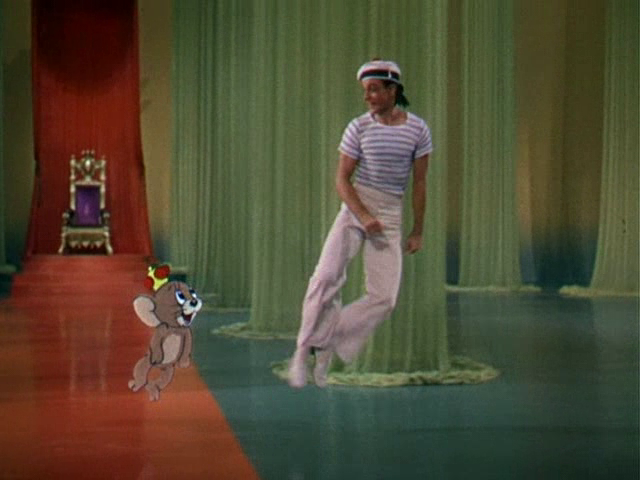 Its primary calling card — what all viewers immediately think of when they recall the film in their minds — is Kelly’s “celebrated duo with MGM cartoon star Jerry the mouse”, executed to perfection; any film fanatic unfamiliar with this number should immediately check it out on YouTube. 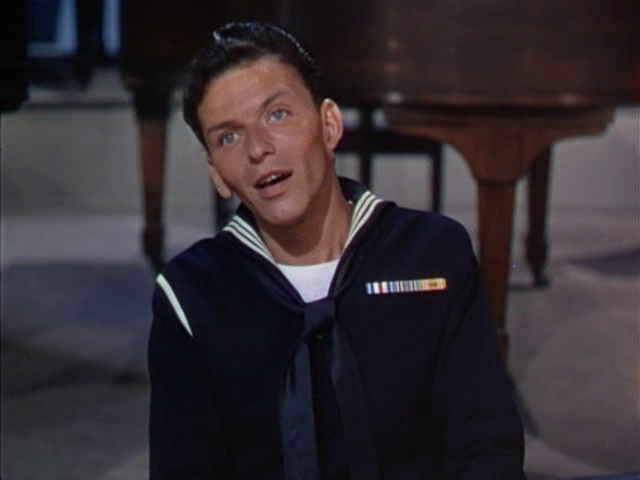 In addition, as Peary notes, “Sinatra’s singing (of okay songs by Jules Styne and Sammy Cahn) is silky smooth” and the “MGM Technicolor is gorgeous”. However, while it’s recommended for one-time viewing, this film is only must-see for musical fans and/or devotees of either Kelly or Sinatra. No, though Kelly’s dance with Jerry is definitely must-see — check it out on YouTube. In agreeent with the overall assessment: not must-see. First-time viewing. ‘AA’ is the kind of musical that falls somewhere between one of the Astaire-Rogers or Berkeley musicals and the example of a musical at its peak (something like ‘Singin’ in the Rain’). Unlike the former, the script is at least pleasant-enough that we’re not cringing through the dialogue as we wait for the next musical number. But also unlike the latter, ‘AA’ is not top-drawer material – where the script is so strong that it’s really hard to fault it much at all. Yes, the film is too long – but that’s in keeping with its main aim (I think) which is Entertainment+: the film does feel like it wants to give the audience value for its money, so it doesn’t hesitate in finding every which to do so. It’s not a boring film and we are, more or less, consistently entertained. (Production design is MGM at its glossiest.) The main problem is that, ultimately, for all of its effort, it’s not as memorable as it needs to be. Most of the songs are, unfortunately, way too forgettable. And, yes, Grayson’s singing style has not held up well – it must have been very impressive in its day, but now it seems a bit shrill and, perhaps, better suited to opera than a musical comedy film.